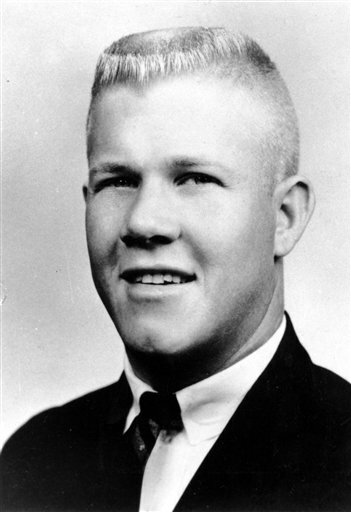 Former Eagle Scout, ex-Marine, and engineering student Charles Whitman murders his mother and wife, then carries a cache of firearms to the top of a 300-foot tower on the campus of the University of Texas at Austin, where in 90 minutes he kills 14 and wounds 32 with sniper fire. Charles Joseph Whitman was an American mass murderer who became infamous as the “Texas Tower Sniper”. On August 1, 1966, he murdered his mother and wife in their homes, then went to the University of Texas at Austin where he shot and killed three people inside the university’s tower. He then went to the tower’s 28th-floor observation deck, where he fired at random for some 96 minutes, killing an additional eleven people and wounding thirty-one before being shot and killed by police. Sixteen people were killed in total; a 17th victim died in 2001 from injuries sustained in the attack. 1961: Whitman entered the mechanical engineering program at the University of Texas at Austin on September 15, 1961. 1962: On August 17, 1962, Whitman and Leissner were married in a Catholic ceremony held in Leissner’s hometown of Needville, Texas. 1966: Whitman met with Dr. Maurice Dean Heatly, the staff psychiatrist at the University of Texas Health Center, on March 29, 1966. 1966: At approximately 4:00 p.m. on July 31, 1966, Charles and Kathy Whitman visited their close friends John and Fran Morgan. 1966: On August 1, 1966, he murdered his mother and wife in their homes, then went to the University of Texas at Austin where he shot and killed three people inside the university’s tower.